“Pussaaaaa! Vaammaa, paal kukkeyn!” (“Come here, drink some milk!”), aththi called out gently and sweetly. Ms Feline Attitude (FA) gave her a disdainful look, tossed her head as only the callously cold of her species could and would, flicked the tip of her tail, and walked away in what Wodehouse would have called ‘a marked manner’. But let me rewind a bit. On the west of our house, with a stone slab compound wall separating the property from ours, was the home of Sri Thirumale. With his family lived an elderly lady (his mother, if I recall rightly), whom we all called aththi. Aththi was a very elegant elderly lady, slightly older than ‘middle’ age. Very dignified personality! Clad in a nine-yard saree, worn Iyengar style, she was the very picture of refinement. The aforementioned feline, fondly called Pussaa, was a black-and-white number full of attitude; very aloof most of the time. Uncle showed up with a few Parle Monaco biscuits and we took turns to feed her. The next thing I remember: Missie had moved into our house! We all took to her greatly, feeding her milk and what-have-you. She too seemed to have more or less accepted us, despite her innate snootiness. Why, she even went as far as bringing a dead mouse or two to amma; perhaps expecting the latter to make bajjis with it or something, I don’t know. There matters rested for a while. Occasionally, that scene I outlined at the beginning would unfold, with the same ending. Aththi used to tell amma, “Look at her! After all these years of living here and being with us, how she has just left us and won’t even respond!” Amma felt badly for aththi, but what to do? You cannot reason with felines. Of a morning, after everyone except me (I ‘worked from home’, if you have been following me thus far) had been sent on their way and the morning round of work was all done, amma would settle down to read her Tamil magazines on the front door step. “Pussaaaaa… vaammaa ingey” (“Come here”). And Missie would sit next to her, in the most compact way possible, eyes closed, and thinking feline thoughts. Photography was a rarity in those days. What a picture the two would have made! And one day, Ms FA disappeared. We all wondered what had happened to her. Amma, being amma, feared The Worst. You must understand something about amma – she always despatched people. She always used to ask questions like, “Subbu is dead, isn’t he?” Or Venki or Ranga or whatever the name might have been. She never asked if Raman or Lathangi or Ponni was alive! In her mind, Ms FA had become, more likely than not, terminally inconvenienced, if you know what I mean. It was about 5 pm and it was pouring ca… well, it was pouring! Amma was in the kitchen, having started making the evening tiffin for when the hungry hordes returned puffing and panting and demanding supplies. Tiffin today consisted of puris. Since I was not frightfully busy in those days and “working from home”, I was tucking in my share of the fried delicacy with potato gojju on the side. The rear door was evidently left ajar. Suddenly, we see Ms FA, dripping wet, pausing by the kitchen door, a little kitty kat baby, equally moist, dangling from her mouth. Amma started laughing. I joined in. Amma said, “Adi, thadichchi, idhuva un kadhai?” (“Oh, little fatty, is this your story?”). I think amma didn’t want to get up and go away from the stove (an Umrao kerosene deal with a half-inch wide tape wick, if you must know). And I didn’t want to stop my gorging. One had priorities, even at that age. So, we sat there as Missie walked past the kitchen four times. Each time, she had a bebbee with her. When she did not return for a fifth, amma and I could not contain our curiosity. We walked out to find her. And there, in uncle’s room, on a well-upholstered moda, was Her Highness, stretched out in a semi-circle, suckling four absolutely adorable little kitties. She used to take the little ones for walks in the front yard, across the road to Sub-Inspector Shamanna’s open veranda, and all that. There were a pack of street dogs—among them a black-furred fellow who wanted to have Missie and fly (fly = family, you don’t know?) for a snack. She was having none of it. One day, the dogs ganged up and tried to attack her while she was out with the babies. She inflated her tail, put her ears back, hissed, snarled, and struck out at the ring leader (yes, the black-furred fellow) missing his left eye by a … ahem … whisker. None of them ever bothered her again. They would sit around and glare at her resentfully while she proudly took the family on their daily outings, her tail held up like a flag. Aththi used to smile wistfully (if ‘wistfully’ is the word I want) when she saw Missie and the brood. 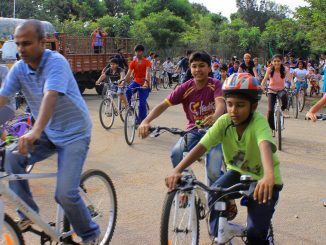 It’s rainiest November in Bengaluru since 1916; more to come! 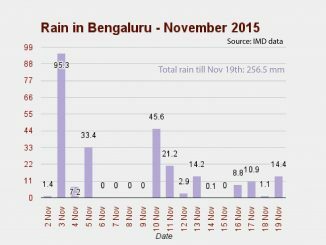 This November, the rain in Bengaluru broke all records. The wettest in over hundred years, you gotta wait a few more days to see the sun shine!